SupersizedMeals.com: Hardee's Thickburger - Awesome! This has been around for a while now, I was wondering whether it still exists? Sounds like a heartstopper! NEW YORK (CNN/Money) - Fans of Hardee's new "Monster Thickburger" may end up making "Big Mac" lovers look like waif-like supermodels. Hardee's rolls out its new "Monster Thickburger," which contains two 1/3-pound slabs of Angus beef, four strips of bacon, three slices of cheese and mayonnaise on a buttered sesame seed bun. St. Louis-based Hardee's said its new burger boasts two 1/3-pound slabs of Angus beef, four strips of bacon, three slices of American cheese and some mayonnaise -- all on a buttered, toasted, sesame seed bun. The "Monster Thickburger" will cost about $5.49, Hardee's said. 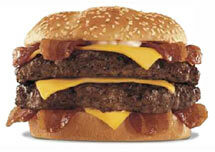 But chowing down on the 1,420-calorie burger, which contains 107 grams of fat, will cost around $7 with fries and a soda. "The (original) 'Monster Burger' was one of our most popular menu items," Brad Haley, executive vice president of marketing for Hardee's, said in a statement. "(But) it's now a 'Thickburger.'" Many fast-food chains, including McDonald's (Research) and Wendy's International (Research), have tried to offer healthier menu items to cater to Americans on low-fat, low-carb diets. But Hardee's said the "Monster Thickburger" is not all it has to offer on its menu. "In about 30 days, we will be introducing a BBQ chicken sandwich that would only have 4 grams of fat and 300 calories. We just have a wide range of selections for everybody," Haley said. Hardee's is owned by CKE Restaurants (Research) of Carpinteria, Calif., whose stock rose about 1 percent Monday.